The Knutsford Pavilion is the ideal size for entertaining guests outdoors as it can comfortably fit a barbecue, dining set, or even a hot tub. Its sturdy roof provides the perfect protection against the elements and with its side panels, The Knutsford Pavilion provides shelter for a large party of guests. Dimensions 2.80m x 2.80m x 2.30m, Internal W x D: 2.40m x 2.40m, Weight 150kg. The Knutsford Pavilion is the ideal size for entertaining guests outdoors so you can extend your social circle out into the garden! 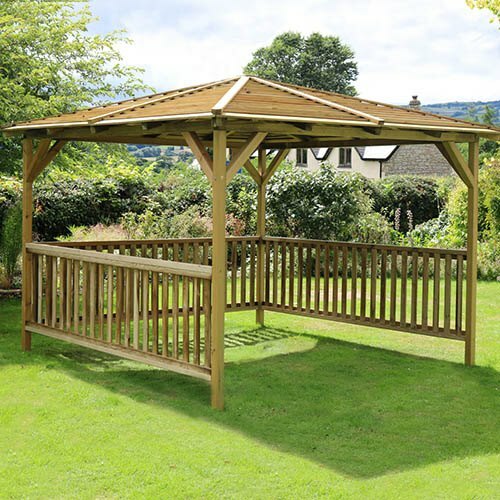 Big enough to comfortably fit a barbecue, dining set, or even a hot tub, this beautiful pavilion can really enhance your garden and give you so many options for keeping your friends and family entertained. Its sturdy roof provides the perfect protection against the elements so you can enjoy your garden whatever the weather and as it comes complete with side panels, The Knutsford Pavilion provides shelter for a large party of guests. Made from pressure treated, FSC Certified timber for a 10 year guarantee against rot, this is a garden feature that will really give your garden the WOW factor! Self-assembly required (min 2 people). Dimensions 2.80m x 2.80m x 2.30m, Internal W x D: 2.40m x 2.40m, Weight 150kg. Knutsford Pavillion 2.80m x 2.80m x 2.30m, Internal W x D: 2.40m x 2.40m, Weight 150kg. IMPORTANT: This item is delivered directly by our third-party supplier. Note, a valid mobile number and email address are both required to deliver this item. Please provide these when you place your order.